On September, 2018, the Peace Education Development Forum for Global Advancement was held. The Peace Education Project, which is one of the core initiatives of HWPL, was initially proposed as a groundbreaking way to achieve the realization of Article 10, “Spreading a Culture of Peace”, of the Declaration of Peace and Cessation of War (DPCW). 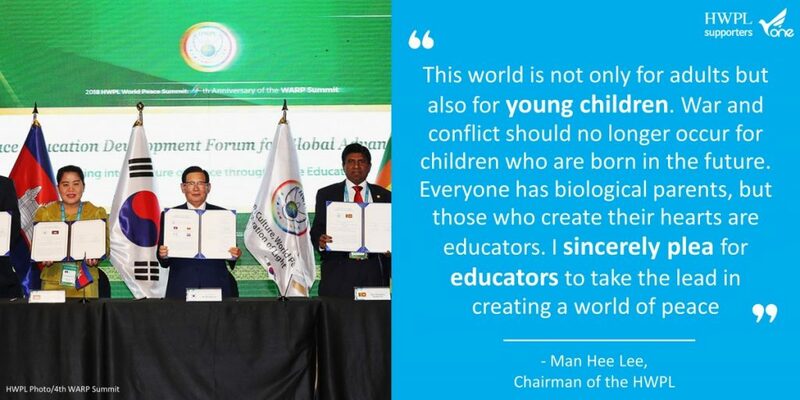 As a result, 164 schools in 12 countries have signed MOUs with HWPL. On this day, ministers and vice ministers representing the Ministries of Education in Sri Lanka, Cambodia, Guatemala and Iraq signed an MOA with HWPL and 30 schools in nine countries also signed an MOU simultaneously. The Chairman Man hee Lee is a really powerful messenger of peace. It is why 3.6 billion Women and 1.8 billion Youth support him. Everything is up to you! Mr. Lee is truly doing something monumental. As a Korean War veteran who has experienced the horrors of war first-hand, I have great respect for his work of peace. Thank you.